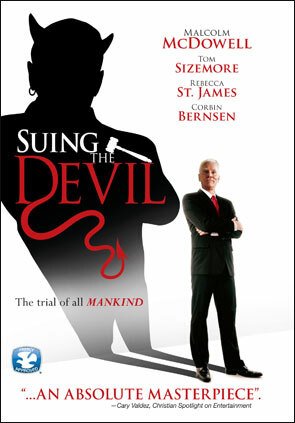 Today’s feature is a Christian courtroom thriller/drama that is as self-explanatory as possible: Suing The Devil. Suing The Devil was written, directed, and produced by Timothy A. Chey, who has worked on a number of Christian movies that are designed to be inconspicuous, including The Genius Club, Live Fast, Die Young, and Gone. The cinematographer for the film was Tom Gleeson, who has done some camera work on films like Happy Feet. The effects for the movie were done by a team that included Ricardo Echevarria (Eight Crazy Nights, The Iron Giant), Ross Newton (Argo, Ant-Man), and Stacy Lande (The Prophecy). 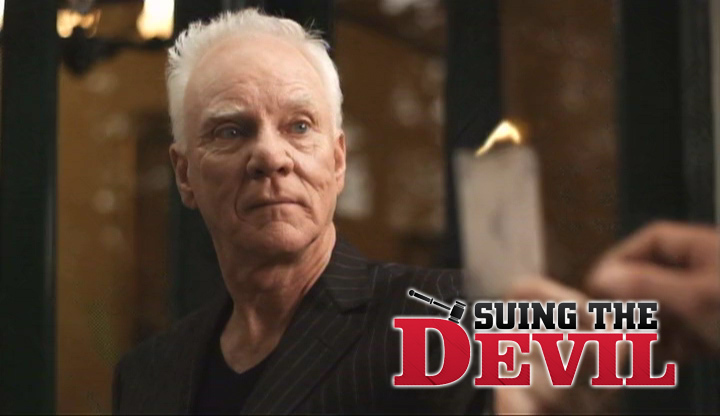 The cast of Suing The Devil includes Corbin Bernsen (The Dentist, The Dentist 2), Tom Sizemore (True Romance, Natural Born Killers), and Malcolm McDowell (A Clockwork Orange, Caligula), who also served as a producer. A number of the lead roles, however, are filled in by unknowns, like Shannen Fields and Bart Bronson. A down-and-out law student sues Satan for $8 trillion dollars. Satan appears to defend himself and the trial of the century takes place. 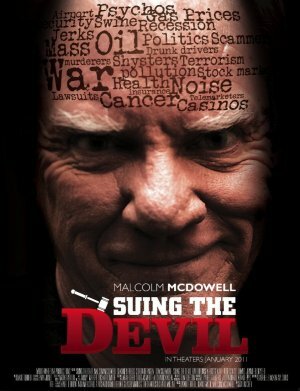 As with many Christian films, the reviews for Suing The Devil from both critics and audiences were dramatically polarized. 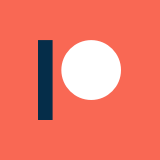 It currently holds a 4.8 rating on IMDb and a 39% audience score on Rotten Tomatoes, but both user-submitted review sites feature a whole lot of 1-star and 5-star reviews, with very little in between. As you would expect, the message of Suing The Devil is beaten over the audience’s head constantly: everything bad is Satan’s fault, Satan is real, etc. This is a consistent aspect of many Christian movies I have watched: they get so wrapped up in their message that they forget to do literally anything else, which ultimately (and, I suppose, ironically) weakens the message as a result, by not providing it any realistic foundation. As far as specific problems with this movie go, the first and biggest one is with the premise itself, and the movie’s abysmal writing. The biggest question in the plot, obviously, is: “How do we know Malcolm McDowell is Satan?” If he isn’t proved to be Satan somehow, then the trial at the center of the movie has no foundation. This is brought up early on by the judge, but totally dropped after she is distracted by the room getting uncomfortably hot. This is the equivalent of a Looney Toons misdirection gag, and the result is that McDowell is not proven to be Satan, but the trial goes on anyway. Eventually this issue of identity comes back up late in the movie, but the idea proceedings would have gone anywhere without proof of identity is beyond absurd. Going further than that, that premise that Satan exists at all (regardless of whether it has a physical form, let alone a Malcolm McDowell form) is completely brushed over, as it is assumed in the courtroom that the Bible is literal fact. The ultimate “resolution” to these issues comes late in the trial, when McDowell is prompted to vomit computer-generated fire after he has a bible passage read to him, because only evil supernatural beings are capable of pulling off such shoddy effects. The characters that fill out the background of Suing the Devil are a bizarre lot. Satan’s assumed supporters include three distinct groups of people, who apparently make up most of the world’s population in this Christian persecution fantasy-land: Satan-worshipers, theists who dislike God (Satan’s entire defense team), and atheists, who really shouldn’t have a dog in the fight, but apparently are universally evil and operate oil companies. Speaking of folks who have no investment in this religious trial, it is casually mentioned that countries like Pakistan and North Korea are live-streaming the court case. I think the writers meant this to represent that evil countries were pulling for Satan, but that makes no sense whatsoever, and reveals quite a bit about their limited knowledge of religion and world affairs. Suing the Devil has one of the most distinct gulfs of on-screen talent that I have ever seen in a movie. On the positive end is Malcolm McDowell, who, even though he is clearly only present to receive his paycheck, has some solid moments as Satan. Honorable mentions also go to Tom Sizemore, who briefly hams up a performance in his handful of appearances, and Corbin Bernsen, who apparently loves showing up in this schlock Christian movies. However, the lion’s share of the primary roles go to actors who sound like they wouldn’t make the cut for a community theater production. The lead, for instance, has some of the worst deliveries I have seen in a very long time, and he spends most of the movie in frame. At the very least, I would say it is a little surreal to see sub-amateur performances interspersed with decent Hollywood actors slumming it for a paycheck. I would love to be able to recommend this movie based on the premise and Malcolm McDowell alone, but this film is one of the most boring and inane things I have ever sat through. The bafflingly terrible performances are only entertaining for so long, and the writing has no sense of pacing, style, or subtlety. That makes the movie as a whole about as interesting to watch and listen to as a sermon without any charisma. If there was a super-cut of the movie (which clocks in at an agonizing 2 hours long) of just the Malcolm McDowell sequences, I would recommend watching that for the humor factor of the bad writing and performances. The whole thing, however, is not worth sitting through.